AAfG is proud to present the following public discussion on the rise of fascism in Europe where Aris Chatzistefanou – the director of “Catastroika” and “Debtocracy” – shall be presenting snapshots of ‘Fascism Inc.,’ his documentary in-the-making. This shall be followed by an open discussion on the rise of fascism across Europe. Tariq Ali and Dr Jim Wolfreys to be part of the panel of discussants Other participants to be confirmed in due course. Admission is free however AAfG would strongly recommend that attendees make a donation at this event, a large part of collected donations would go to fund the making and distribution of ‘Fascism Inc.,’. 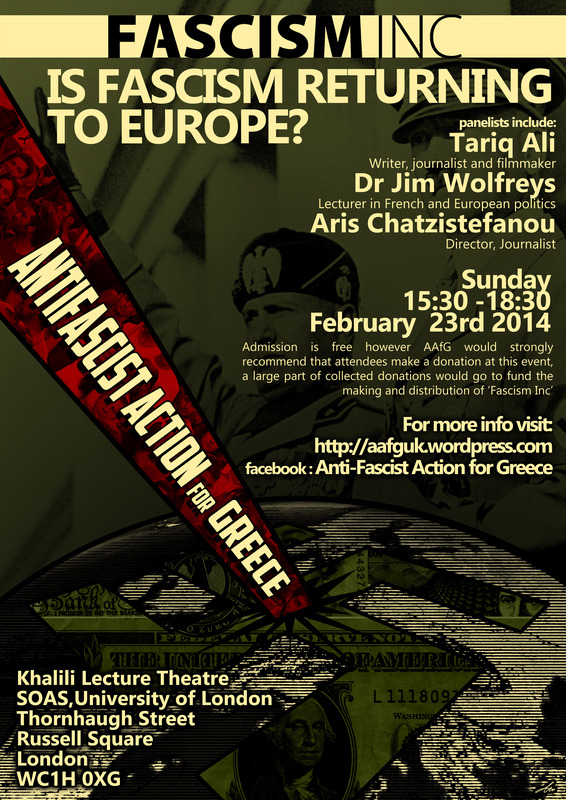 This event is organised and supported by Anti-Fascist Action for Greece. NOTE: Due to the high interest in this event, we have created a free registration page. If you’re planning to attend, it is essential to book a ticket (free of charge) in the following Eventbrite link: press here. Please print your ticket and bring it with you at the event. The issuing of tickets begins on the morning of Sunday 16th Feb and will continue until the venue becomes fully booked. You can also visit our event page on Facebook here. Why doesn’t the Polish Antifa have a RED flag, only black flags?